Eugene I. Gordon, a native of New York City, was born on 14 September 1930. He received the B.S. degree from City College of New York in 1952, and the Ph.D. from M.I.T. in 1957, both in physics. 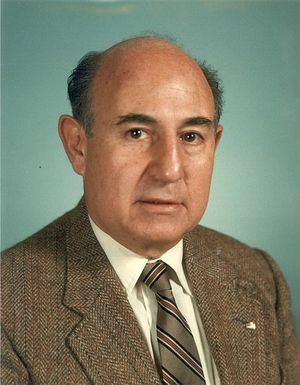 Dr. Gordon retired from Bell laboratories in 1983, where he was Director of the Lightwave Devices Laboratory. He has worked in the field of gas-discharge physics, microwave traveling wave tubes, gas and semiconductor, injection, lasers, acousto-opto modulation and deflection devices, and image and display devices. He has directed the Bell Labs programs in electron beam pattern generation, integrated circuit packaging, internal device marketing and customer engineering, and technology forecasting. He has been a Department of Defense consultant since 1970, serving in various capacities with the Advisory Group on Electron Devices. He has been a member of the Administrative Committee of the Electron Device Society for several terms, and a founder and first chairman of the IEEE Quantum Electronics Council, which later became the IEEE Quantum Electronics and Applications Society. He was an associate editor for the Electron Device Transactions and the Journal of Quantum Electronics which he co-founded. He was founder of Electron Device Letters. He has been active in IEEE award activities in various capacities for many years. Dr. Gordon is a member of Phi Beta Kappa and Sigma Xi and a Fellow of IEEE (1968). In 1975 he received the IEEE Vladimir K. Zworykin Award, in 1978 was elected member of the National Academy of Engineering, and in 1984 he was awarded the IEEE Edison Medal "For a singular career of invention, development, and leadership in electron devices." He is the author of over 50 articles published in peer reviewed journals, and holds 24 patents. Dr. Gordon, his wife Barbara, and their two sons, Larry and Peter, reside in NJ. He shares with his family a strong interest in tennis, skiing, sailing and other outdoor activities. In his spare time, he has developed surgical techniques using the continuous argon ion laser, which he invented. Gordon died on September 15th, 2014. This page was last edited on 25 January 2016, at 17:30.